Online registration for this event is closed. Paper registration will be available during packet pick up. Capital Striders member-discount is available on Step 2 (only available for preregistration). This is a fall race that runs on both single and double track dirt. The trail takes you deep into the woods. Walkers may participate and are encouraged to register for one of the shorter races. The course will remain open for 3 hours. Proceeds from this race will be used to purchase trail signage/maintenance equipment for Des Moines' dirt trail systems, support CITA, and the Capital Striders Turkeys. There will also be a prize for the best costume (determined by 3-5 volunteers while participants are running/walking) for each of the following categories: Red Riding Hood, Wolf, and Best Miscellaneous. Registration is available at packet pickup and on race day, $40. No Capital Striders' member discount. Active Endeavors is one of our many generous sponsors so please consider looking around the store while you are at packet pick-up. 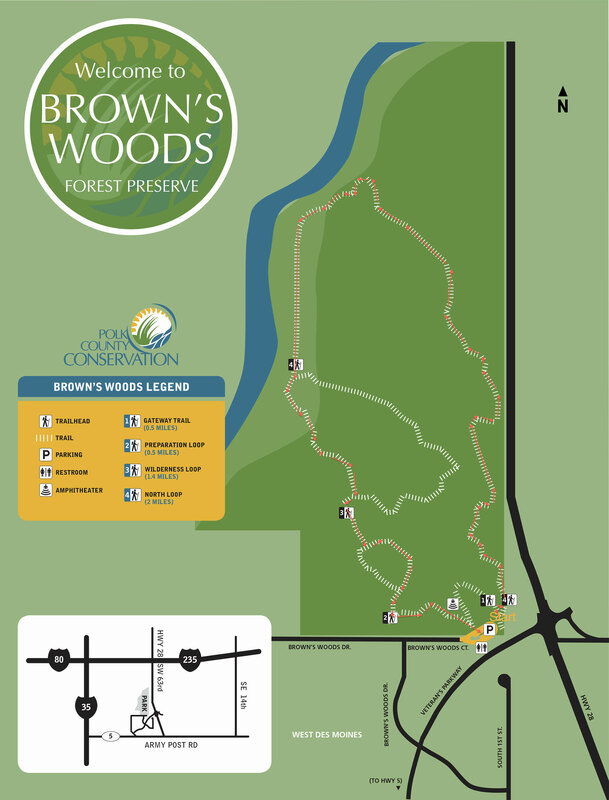 Packets will also be available on race day (at Brown's Woods) from 8:00 AM until 8:45 AM. Please allow adequate time to pick up your packet if you are planning to do so on Sat. morning. The packets will include your swag (a drawstring bag and a surprise), a few flyers, and your bib with safety pins. Please wear your bib/race number on the front of your shirt or shorts. Click here for an interaction map. From 235 or Grand Ave. go south on 63rd Ave and turn right on Brown's Woods Drive; if you reach Army Post Rd. you've gone too far south. After turning right, turn right again and go right on the dead end road (Brown's Woods Dr.) and park in the new paved lot. When this lot is full, you'll need to park in the old gravel lot 1/2 mile the other direction on Brown's Woods Drive. Please plan to carpool and arrive early. When coming from Route 5, SW Connector has been renamed Veterans Parkway. Address (to new parking lot): 495 Brown's Woods Dr, West DSM, IA. Please park in a designated spot and comply with all volunteer requests. Parking will be significantly limited so please plan to carpool and leave extra time for a potential 1/2 mile walk to the start area. The course will have water and Gatorade Endurance on course and at the finish line. You are encouraged to bring a water bottle to refill during or after the race since we are trying to keep our event as Green as possible. Fresh fruit, cookies, ice (if it's a hot day), and other snacks will be available at the finish, as well as, additional ice-cold water and Lemon Lime Gatorade. Feel free to bring a bandana/hat (to place some ice in, after the race) and a lawn chair or blanket to hang out and watch others finish and get to know your fellow trail runners. We will have music playing near the start/finish line. We will have a photographer, Paul Nye, of Panfoto, on the course. One to two weeks after the race, we will share a link to download your free race picture(s) or make a purchase. The course is marked with orange or pink ribbons and yellow signs with arrows. There are also signs stating "Wrong Way" to prevent turning down side paths. You will see a course marker at least every quarter mile. The course tends to be dry with a hard, uneven surface. Be careful of crossing the wooden bridges or stepping on the wood steps as they can be really slippery from morning dew. Also watch for ruts in the ground and watch your footing throughout the race. There will be cones placed in large holes (when known) and larger stumps and roots will be marked. Remember the motto is "If you look up, you are going down." This is a trail race; be ready for a fun adventure! If you need to pass a runner in front of you and you are on a narrow section of the course, please be courteous and say, "On your left," and then pass on his/her left side. The park has a permanent bathroom structure and a sink. There is also a water fountain on the outside of the building. An additional one or two port-o-potties will be available. Please be careful to not touch or brush the sides of the trail. Many of the Poison Ivy plants are turning red and drooping, but there are others, less obvious and still green. "Leaves of 3, leave them be!" This race has ground poison ivy and vines that grow quickly into the path. Some of the other plants to the sides of the trails also have thorns. Please be aware of your surroundings throughout the race. Vigorous scrubbing with Dawn (degreaser) Soap works well to prevent an allergic reaction; best when used in the first 24-48 hours following the race. The weather tends to be unpredictable (average start temp of 65 degrees with daily highs at or above 80 degrees) with high humidity. With these weather conditions, you may want to wear or bring bug spray since you will be running within dense woods and near water. Some runners may also want sun block and/or sunglasses. I want to recognize all of our very generous sponsors and when you stop into their businesses, please let them know that you appreciated their support of To Grandmother's House We Go Trail Races. Our sponsors include: Active Endeavors and Road ID. When this page loaded, the official time was 8:17:50 AM EDT.